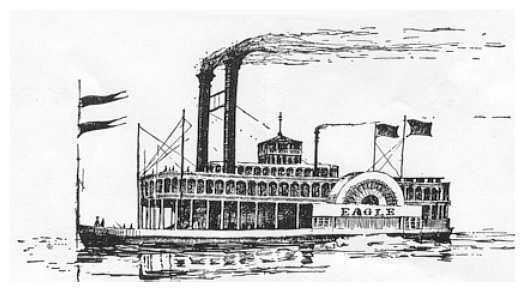 On March 16, 1822, Captain Morris piloted the steamboat The Eagle to Little Rock, seventeen days after departing New Orleans. This became the first steamboat to reach Little Rock. The boat reached Little Rock at an early hour in the morning and Captain Morris, in order to arouse the town, fired a salute of several guns. It did not stay in Little Rock, but headed upriver toward the community of Dwight Mission, founded by Presbyterians in what is now Pope County at the mouth of the Illinois Creek. Due to low waters, it was unable to make it to Dwight Mission. On March 19, 1822, it returned to Little Rock. It then headed back to New Orleans. Though it would be the McClellan-Kerr navigation project before the Arkansas River would become a permanent home to commercial river traffic, boats up and down the Arkansas River helped establish Little Rock as an important trading post. This entry was posted in History, LR Look Back and tagged Arkansas River, Captain Morris, Dwight Mission, John L. McClellan, New Orleans, The Eagle (steamboat) by Scott. Bookmark the permalink.